Before we head into August, here is the latest round of social media updates. Funny enough, all of this week’s updates are about Facebook. Facebook Leads the Way for Referral Traffic: Facebook generates the most referral traffic of all social networks in the second quarter of 2014 according to a report by Shareaholic. Shareaholic’s latest study looked at the eight most popular social networks: Facebook, Pinterest, Twitter, StumbleUpon, Reddit, YouTube, Google+, and LinkedIn. The study examined data from over 300k websites with an audience of over 400 million unique visitors. US Facebook Users Average 40 Minutes Daily on Social Network: Facebook users in the US spend an average of 40 minutes daily on the social network. 20% of that time was spent visiting Facebook from a mobile device. Those figures were revealed during Facebook founder and CEO, Mark Zuckerburg’s opening remarks on the company’s second-quarter earnings call. Facebook Introduces Save for Newsfeed : Facebook users now have the option to save items from their newsfeed. 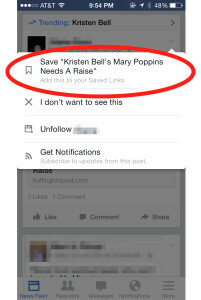 Save is only available for “links, places, movies, TV, and music;” you won’t see it for status updates and photos. Saved items can be retrieved via the left-hand navigation bar on Facebook on the web or the “more” tab on the mobile app.